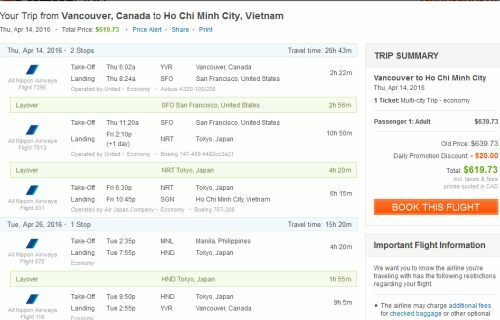 There's an interesting multi-city deal, where you can fly from Vancouver to either Vietnam or Indonesia and then fly home from Manila, Philippines - for just $619 to $643 CAD including taxes. 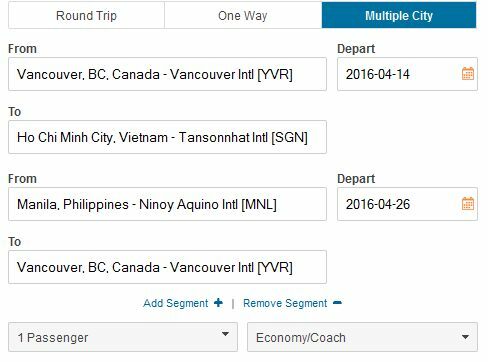 It typically costs around $130 CAD (or less) to fly from Vietnam to the Philippines. And it's only around $90 CAD to fly from Jakarta, Indonesia to the Philippines. Even from Bali, Indonesia, you can get to Manila for around $140 CAD. You can also try mixing and matching the departure & return dates from the list above, for longer trips. There are a large variety of other dates throughout the entire year for $689 CAD (Vietnam) to $725 CAD (Indonesia). Try Tue to Tue flights. 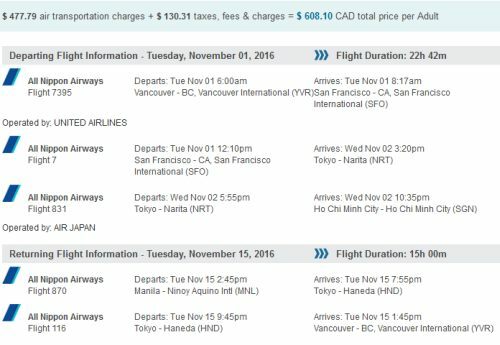 Update 5/18 @ 10:34 AM PST - These are still around, only now there are dates in September, October, November and December 2016, and the prices are slightly cheaper ($598 CAD roundtrip including taxes). The flights are with All Nippon Airways (ANA). You'll find the spot to enter the promo code on the passenger details page (after you've selected the flight). It can be difficult to find. is ranked #6 in the Third Party Booking Site Power Rankings. vancouver, yvr, flight deals, asia, southeast asia, united airlines, indonesia, jakarta, cgk, manila, philippines, mnl, ho chi minh city, sgn, vietnam, saigon, ana all nippon airways and air japan.